Despite the lowest real estate inventory levels in years, sales figures in Steamboat for the first quarter of 2018 were surprisingly quite healthy. While slightly down from the same time last year, through March 2018, just over 200 properties were sold totaling over $135M. While we’re hopeful to see signi cant increases in inventory as the snow melts, it’s doubtful that we’ll return to levels seen over the last few years; this, of course, will lead to continuing price escalation. 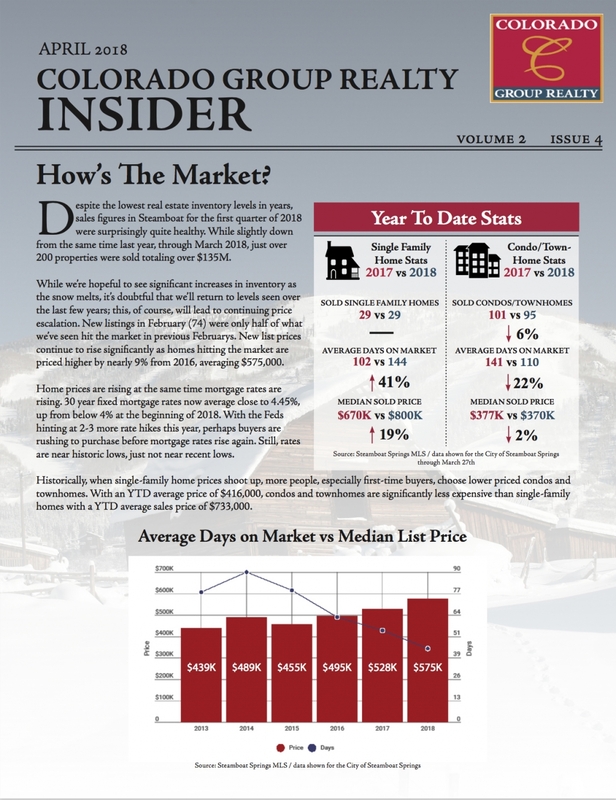 New listings in February (74) were only half of what we’ve seen hit the market in previous Februarys. New list prices continue to rise signi cantly as homes hitting the market are priced higher by nearly 9% from 2016, averaging $575,000.